New Instagram Update! 20 Instagram Features You May Not Know About! New Instagram Update: 20 Instagram Features You May Not Know About! Instagram is constantly changing, adding new features, switching up their algorithm and all around just keeping us on our toes! 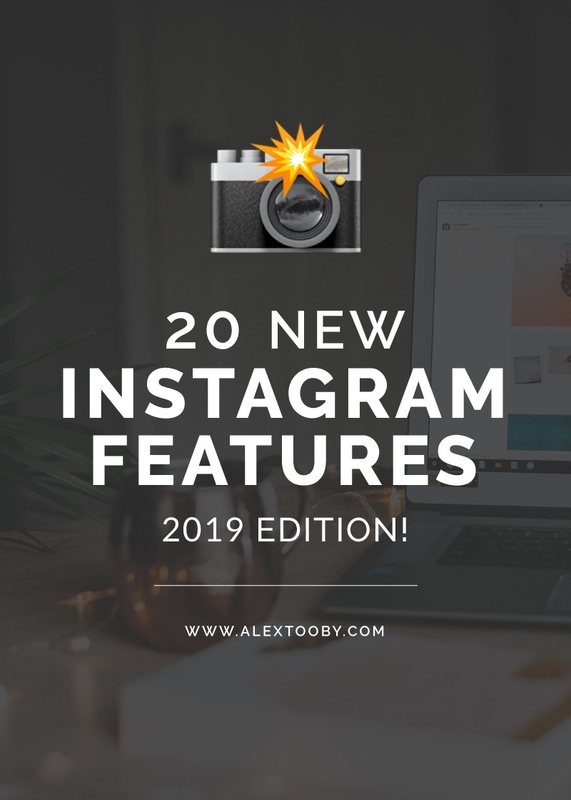 Because of it’s constant changes staying on top of all the new Instagram updates can be daunting, so I’ve put together a list of 20 new Instagram features you may not know about and how to use them! Keep in mind that Instagram is notorious for rolling out (and sometimes removing!) their features randomly and without any predictable order so if you don’t have any of the features I’ve listed, stay patient – they’re coming your way! Prefer to watch the video version of this tutorial? Check out my YouTube Video! Instagram just introduced the ability to track exactly how many impressions you’re getting from individual hashtags! I think it’s safe to say we’ve all been eagerly anticipating this update since previously we’d get a bulk number of impressions generated from hashtags which makes it difficult to determine what’s working and what isn’t. This new instagram update will make it exponentially easier to determine which hashtags are working for us and which ones need to go! How to: navigate to a recent post, tap the ‘view insights’ button and scroll down to the impressions section. Scroll down to the until you see the ‘impressions from hashtags’ section. Here you’ll see the exact hashtag and how many impressions it brought! Not seeing any impressions from hashtags? You may not be using the right ones! To learn how to choose the best hashtags for your unique account, check out Hashtag Hero! No matter what your posting or engagement strategy is, bots and fake accounts still manage to sneak in and plague your follower list (they often come from poorly selected hashtags or engaging with the wrong accounts). These types of followers never like or comment on your posts and are often referred to as “ghost followers”. Having too many of these accounts following you can bring down your overall engagement rate and Instagram doesn’t like that. When our audience isn’t engaging, they think our content isn’t very good and they’ll limit the amount of people that see it! Instead of downloading a third party app (which is likely unapproved by Instagram and can damage your account further!) 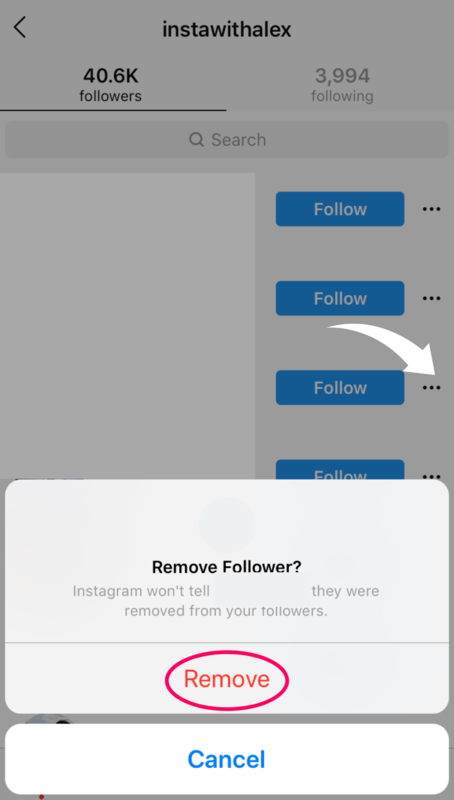 you can use this new Instagram feature manually remove a follower and keep your engagement rate in top shape! 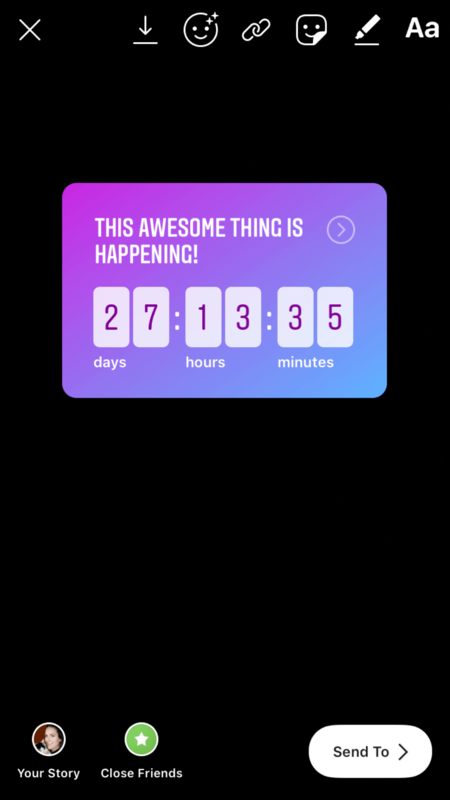 Your audience will be able to subscribe to the countdown timer and they’ll receive a reminder in their notifications when the countdown is complete! 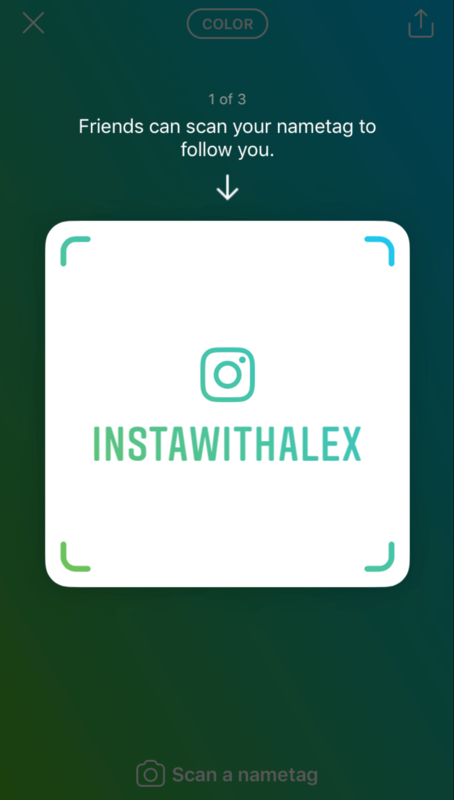 How to: create a new Instagram story and click the sticker icon at the top of the screen (or swipe up from the bottom). Select the ‘countdown’ sticker and enter a title. Then choose the date and time your countdown should expire. You can customize the countdown by tapping on the color wheel at the top of the screen. This will cycle through a variety of colors so you can pick one that matches your account, vibe or story! 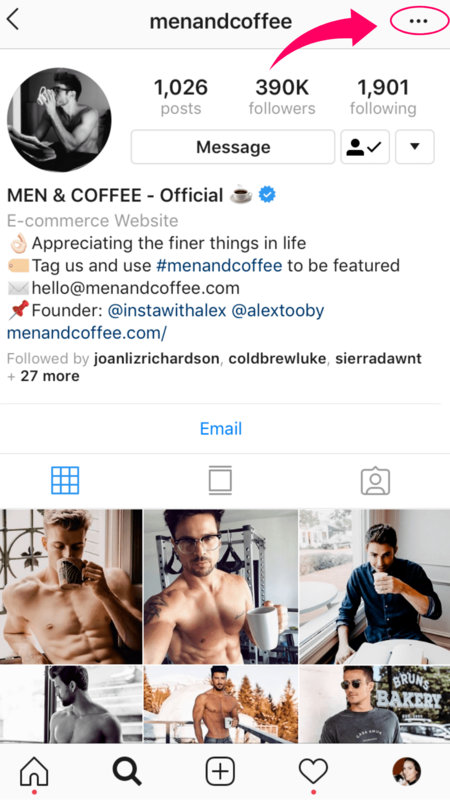 Interested in getting more engagement and sales from your Instagram stories? Check out my course Success by Story to learn how to not only create great looking stories but actually use them to boost your biz as well! Have you ever spent a good chunk of time editing the perfect photo, writing a great caption and tagging a bunch of accounts only to realize you’re on the wrong account?! Well this new Instagram feature helps solve that problem! Now it doesn’t matter which account you’re logged in to because you can easily toggle the account you want your post to publish to. This feature also allows you to publish to multiple accounts at the same time which can make it easier for businesses to share the same message without having to recreate the wheel. Ideally you want to create content specific to each account, however this could come in handy if you want to share a promotional image or update! How to: create a post as normal, then when you reach the details page you’ll see a section titled ‘post to other accounts’. Here you can toggle the account(s) you want to publish your post to. 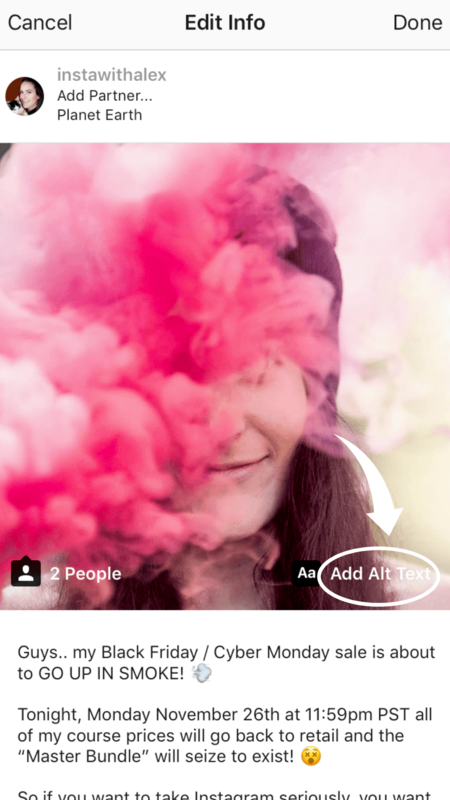 Instagram’s new alt text feature provides users with visual impairments an easier way to enjoy the platform! When alt text is enabled on your images, anyone using a screen reader will be able to hear your image description in detail. 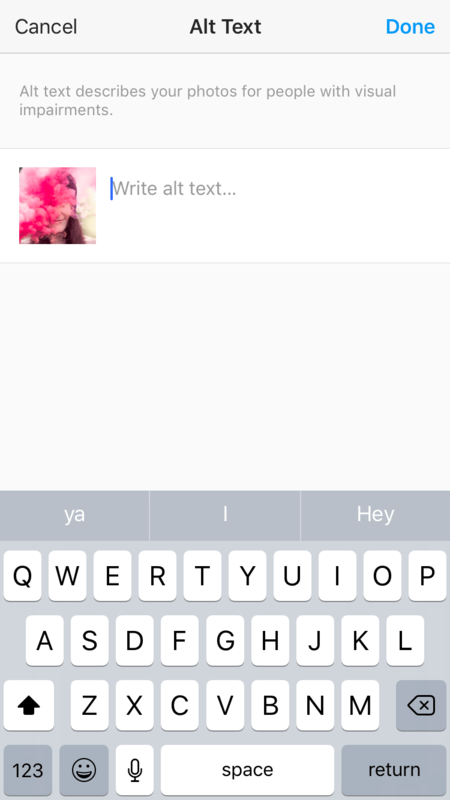 You can customize your alt text or have Instagram auto-generate the description. Personally, I suggest customizing your alt text to ensure you have the most accurate description possible. As wonderful as this type of technology can be, it’s not always the most precise! If you’ve ever researched ‘search engine optimization’ you may know that the alt text you use on your website can help you rank in search results for specific keywords. Instagram hasn’t stated that their alt text will work the same way, but I personally think it’s smart to add alt text to all of your photos just incase they do! Imagine including “female photographer taking a landscape photo” in your alt text and your image ranking in the #femalephotographer hashtag without you even using it..?! Now I may be dreaming but you better give me credit if it becomes a reality! How to: when posting a new photo, select ‘advanced settings’ and under ‘accessibility’ you will see the option to add your alt text. If you want to add alt text to a photo that’s already published to your feed, navigate to the photo, click the 3 dots, hit ‘edit’, then tap the ‘add alt text’ button that appears in the bottom right of the photo. 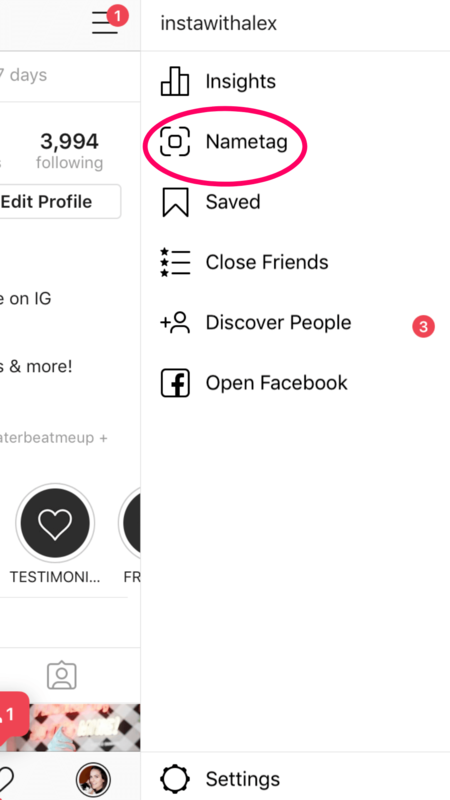 This new Instagram update is drastically changing the Instagram bios and profiles we’ve been so used to seeing over the last few years. While some users are reporting an entirely different look with less focus on follower count and more focused on the information (see the first pic below), others are seeing their bios cut in half and the addition of a “more” button hiding the rest of the bio (second photo below). Because of the later change, we now have to prioritize information so that if someone decides not to hit that ‘more’ button we’re still getting our message across! If you are seeing the shorter bio, you’ll want to move some things around to make sure the first two lines of text explain who you are and include a compelling call-to-action. Reward your most engaged followers with the Close Friends feature! 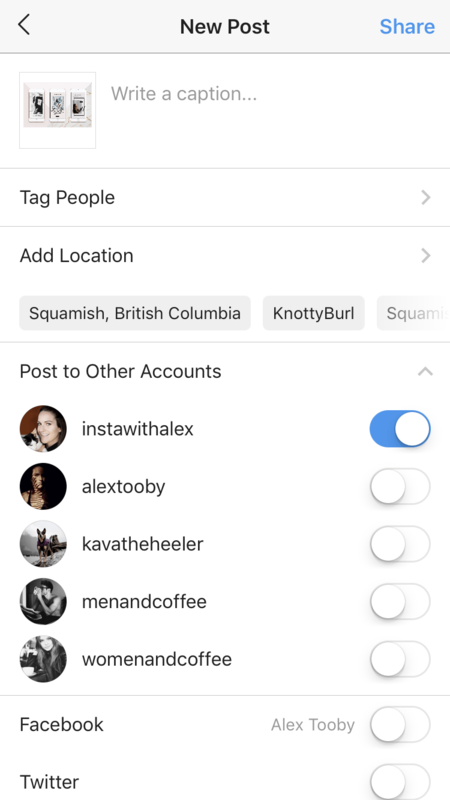 This new Instagram feature allows you to compile a list of people that you can send exclusive stories to, separate from your other followers. 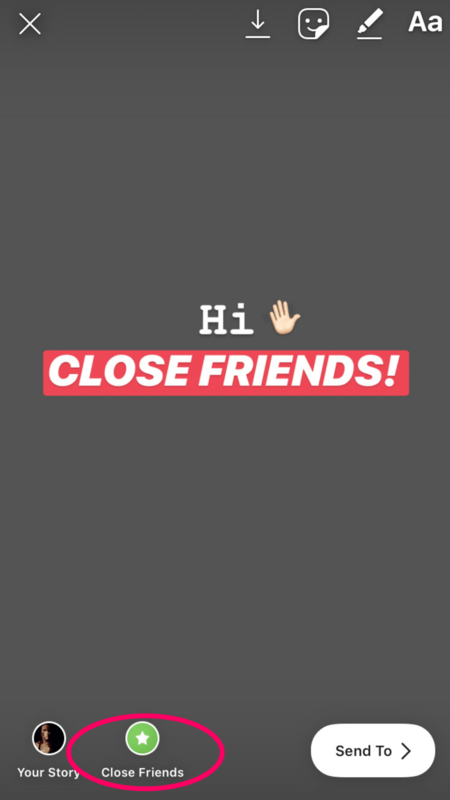 You can create a list of your actual, closest friends and start sending each other secret stories, or you can use it with business in mind and put your most loyal followers or past customers onto the list. From there you could send them exclusive offers, sneak peeks at new products, or any other “insider” information you want them to know about your brand! How to: navigate to your profile and click the hamburger icon in the top right. Select ‘close friends’ and select the people you’d like to be added to your list. From there navigate to your Instagram story camera and create some exclusive content. 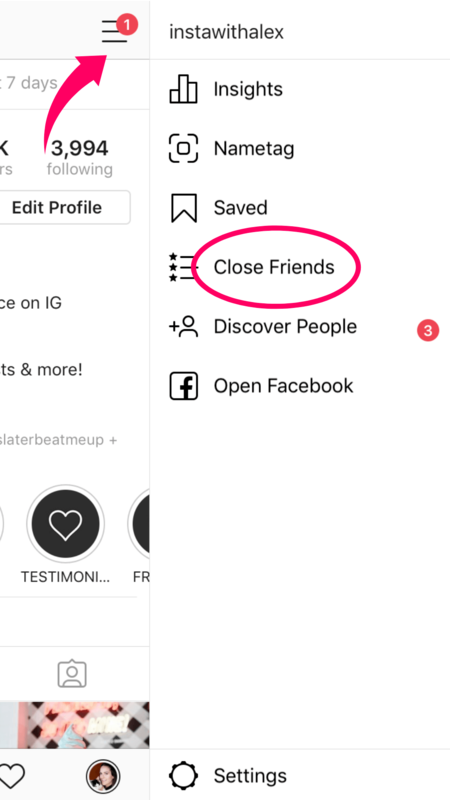 When you’re ready to share, tap the ‘close friends’ icon in bottom right to make sure your story goes to those people only! Note: you can make changes to your list at any time and other users (inside and outside of the group) won’t be able to see the list. I think most of us are familiar with the “Top Posts” section when looking at hashtags. Generally this is where the best performing posts within that hashtag live. In the past this section was customized to each person based on the content that Instagram thought you may be interested in. Because of a flaw in the algorithm, users were regularly seeing their own photos in this section which was often inaccurate and made it difficult to understand if your image was actually ranking or not. With this new Instagram update the top posts section is no longer limited to 10 posts and displays the same images for anyone viewing it. That means if your content is showing up there, you know that you’re truly ranking and may see an increase in engagement and followers! Your information will never be sold or spammed. Promise! How to: navigate to the post you wish to share, tap the airplane icon underneath the image and choose ‘add post to your story’. This will open up your stories camera with the post embedded. You can edit your story to include text, gifs, locations or any of the other content you typically add. Then simply share it to your story and all of your users can click through to the post! 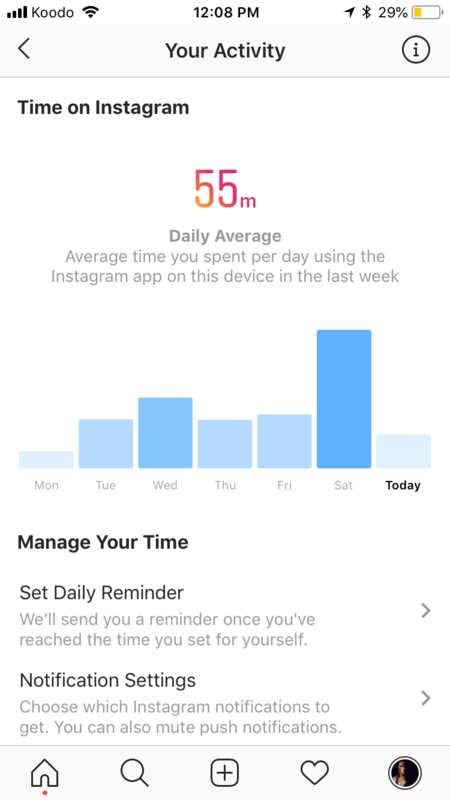 Despite Instagrams usual attempts at keeping you on the app for as long as possible, they’ve recently added a new feature that shows you the actual amount of time you spend on Instagram per day (down to the minute!) While this may be horrifying for many, it’s a great way to track if the amount of time you’re on the app is actually resulting in anything. Instagram even allows you to set up a daily reminder that will notify you when you’ve reached a pre defined time limit. You can also set your standard notification settings here so you aren’t tempted to enter the app every time someone likes one of your photos. Thanks IG! This is another one of those features we’ve all been waiting for! Now you can upload multiple photos and videos to your stories at the same time. Previously you would have to select one image, add all your customizations, share it, then go back into your camera, open your photo album, select another image and repeat. 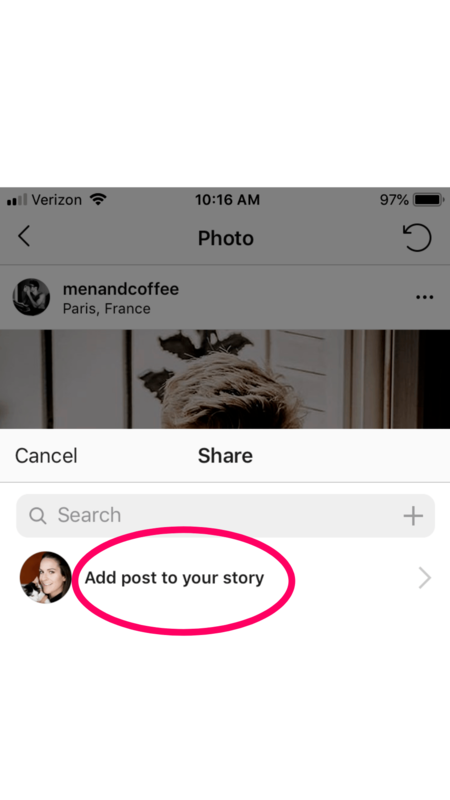 Thankfully this new Instagram update allows you to select up to 10 different photos and images to add to your stories and gives you the opportunity to edit each and every one of them before uploading as a group! How to: navigate to your stories camera by swiping right from your home feed or tapping the camera icon in the top left. Swipe up from the buttom of your screen to open your camera roll then tap the multiple posts icon in the top right. From here you can tap on the images you want to include in your story (take note of the number added to each one as this represents the exact order they will be uploaded) and create a new post. Then tap next and edit each slide as necessary. When you’re ready tap next again and share to your story! Instagram TV. Maybe you’ve heard of it, maybe you haven’t. Instagram released this feature sometime in 2018 but from my point of view, it was a total flop. IGTV is far more complex than the rest of features on this list as it’s basically it’s own app within Instagram. Traditionally you can upload videos to your feed but they max out at 60 seconds. With IGTV you can upload long-form videos that range from 1 minute to a whole hour! This is cool for many reasons, especially for people who regularly create longer videos for platforms like YouTube, however it has many downfalls that you can read in my blog post here: IGTV What is it and How to Use it! How to: Watch my YouTube video for a step-by-step tutorial. 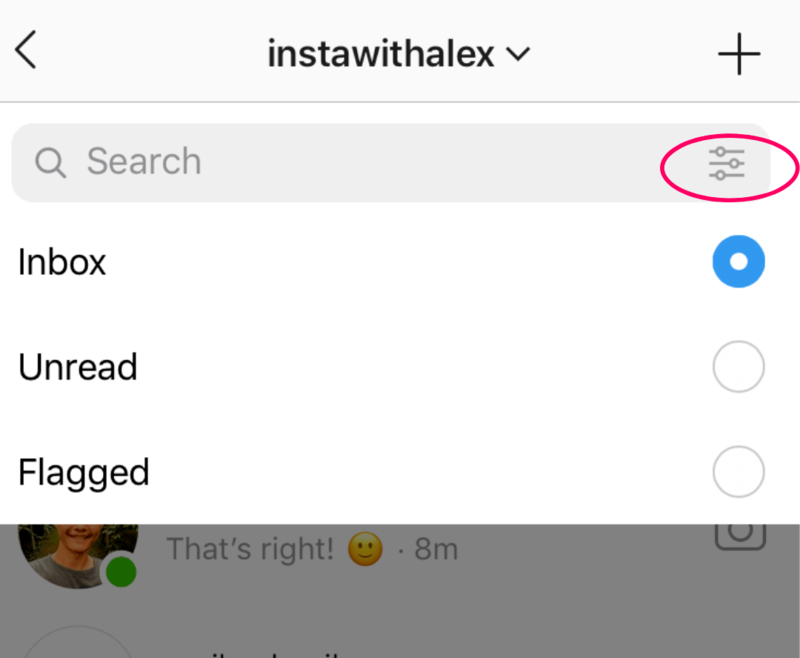 If you receive tons of DMs like I do, this new Instagram feature will come in handy! Now with just the tap of a button you can easily filter your DMs so you can organize and respond to your messages in a systematic fashion. How to: navigate to your DMs inbox by tapping the airplane icon in the top right of your home screen. From there you will see a small icon on the right of the search bar. When you tap that you can choose to display your entire inbox, your unread messages or your flagged messages! Remember QR codes? Well Instagram is trying to make them cool again with this new Instagram update. They’re called Name Tags and they allow you to share your account with others by creating an image that can be scanned, similar to QR codes. While some people see it as an effective tool to use at networking events (in place of business cards), I really haven’t seen or found a useful purpose for it in my day to day. How to: Navigate to your profile, click the hamburger icon in the top right and select ‘name tag’. From here you can stylize your name tag and download it to your phone to share with others. You can also use this page to scan name tags. Alternatively you can go to the search tab and select the name tag icon to the right of the search bar. You know that coveted blue check you see next to your favorite celebrities or mega influencers usernames? That’s verification and in the past, there was no way for the average person to apply for the same status. Now Instagram has opened up the ability to request verification and if you meet the criteria you could have a blue check on your feed as well! How to: Read my How to Get Verified blog post or check out my YouTube video here for the step-by-step tutorial. Due to all of the privacy and data breaches Facebook endured last year, it seems like they are now taking strides to make sure businesses stay transparent and accountable on their platforms. If you’ve ever questioned how someone’s account grew so fast or notice a weird username in your feed, it may be because they bought an account from someone else and added new content to it! 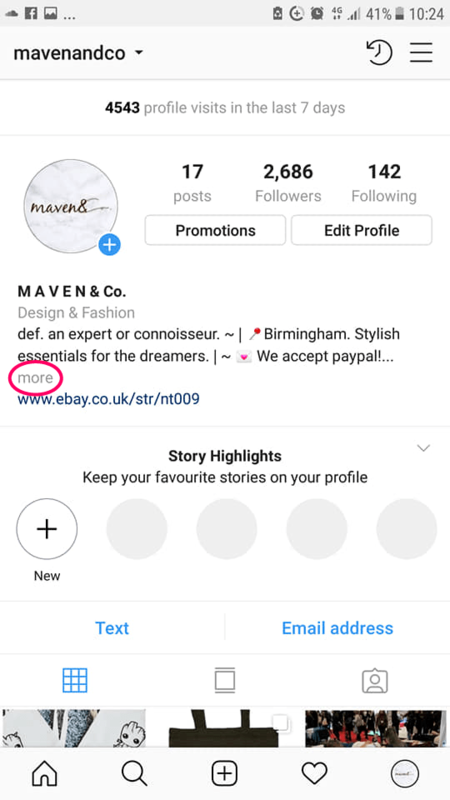 Instagram (and it’s users) see this as misleading so they’ve introduced the ‘about this account’ feature to allow users to check up on this history of someone’s account! How to: go to the profile you are interested in learning more about. Click the three dots in the top right of the screen and select ‘about this account’. Here you’ll see all the details about that particular account. Pay specific attention to the ‘former usernames’ section as this is where you can determine wether an Instagram is authentic or misleading. 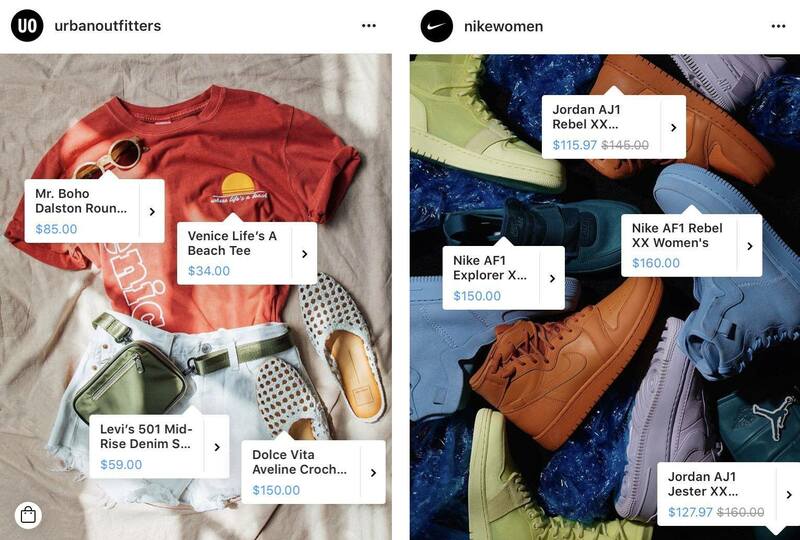 This feature can easily increase your sales but don’t forget that adding shoppable tags isn’t the only thing that will help. Make sure you’re educating your audience about your product and it’s benefits in your caption. THEN (and only then) should you ask them to buy by tapping the link your photo. How to: check out my Shoppable Instagram blog post and YouTube video for the step by step! Ever sent a message to someone only to not get a reply for multiple days? Well now you can catch them ignoring you with the new ‘Activity Status’ feature! When you look in your Instagram DM inbox you will see text beneath each users name that states how long ago they were last active on Instagram. Alternatively, you’ll see a green dot next to their profile picture which indicates they are on the app currently. Now, apart from catching your friends leaving you on “read”, you can also use this feature to show your audience that you’re active and available to chat. As a business owner you want to make sure your audience has every opportunity to reach out to you. So by having your activity status visible, you create an opportunity for communication. If you prefer not to have your activity status visible you can turn it off. 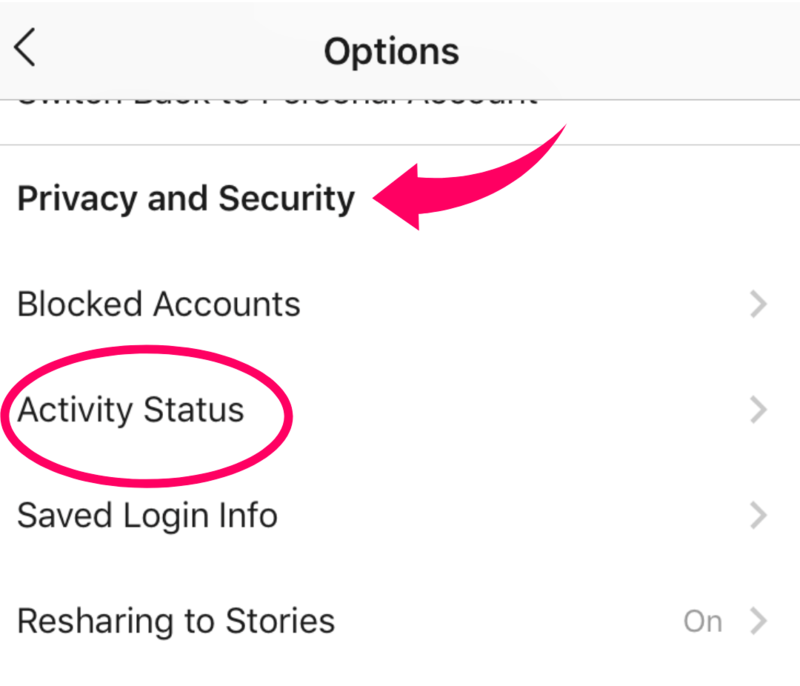 How to: activity status is automatically turned on for all users, however if you’d like to turn it off all you have to is go to your profile, tap the hamburger icon in the top right and select ‘settings’ at the bottom of the page. Then scroll until you find ‘activity status’ and toggle the button to the on or off position. 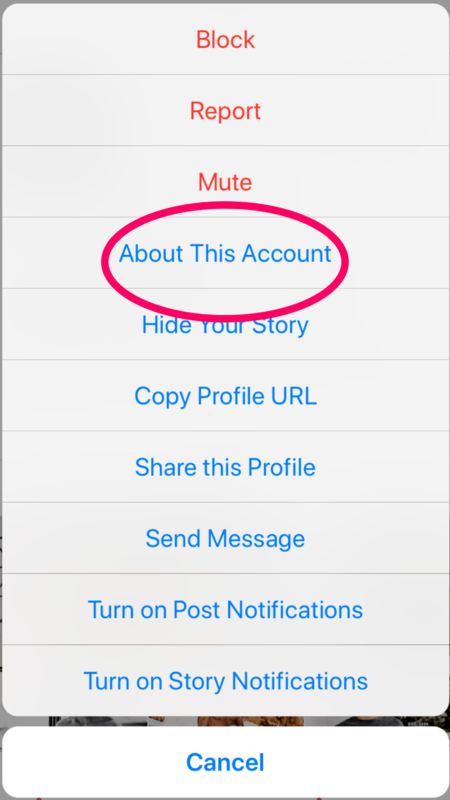 Keep in mind when you turn your status off, you won’t be able to see the activity status of other accounts, either. If we’ve learned anything about Instagram, it’s that the platform can be completely unpredictable at times. 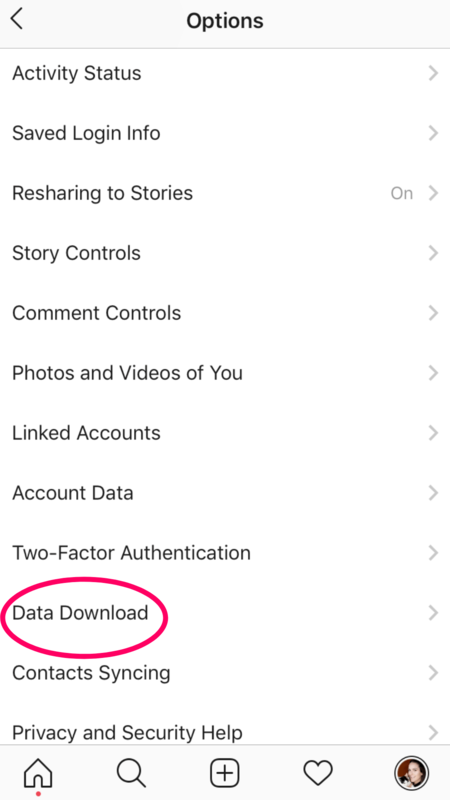 That’s why Instagrams new “data download” feature is such a great addition! 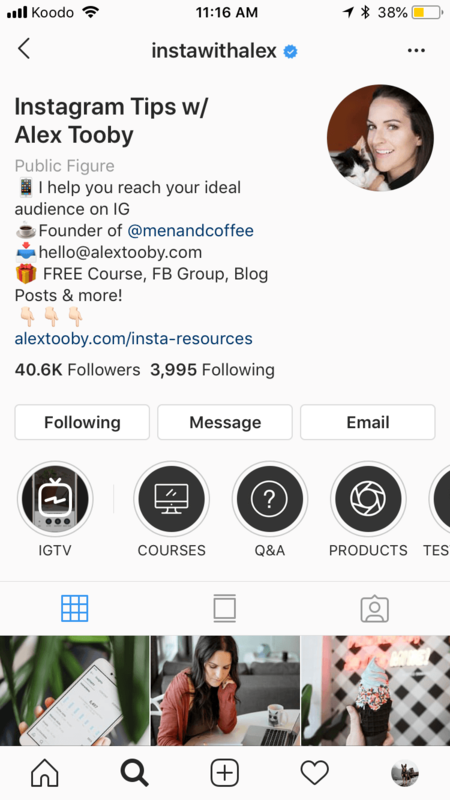 If you want to back up your Instagram account to ensure you never lose any the content on your page, you’ll definitely want to check this one out! How to: Go to your profile then hit the hamburger icon at the top right. Select ‘settings’ at the bottom of the screen, then find and tap ‘download data’. Instagram will ask for your email address, which is where they will send a file with your photos, comments, profile information, and more. 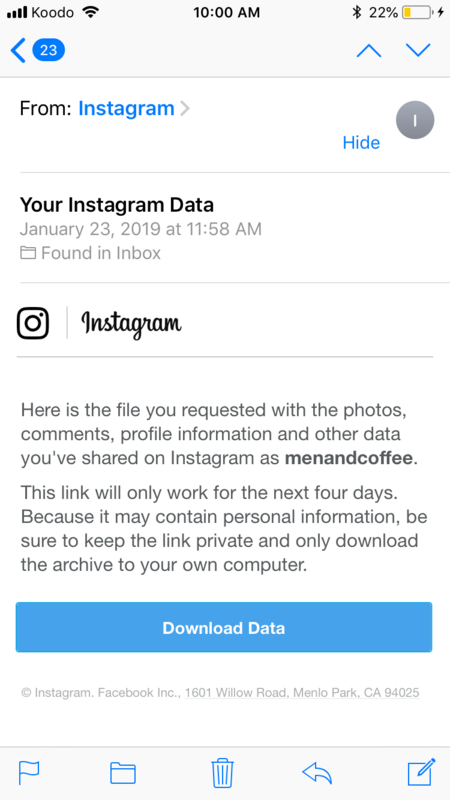 You’ll eventually receive an email from Instagram with a link to download your data. This data is only valid for four days so make sure you access the files in that time frame or you’ll have to request the data again. 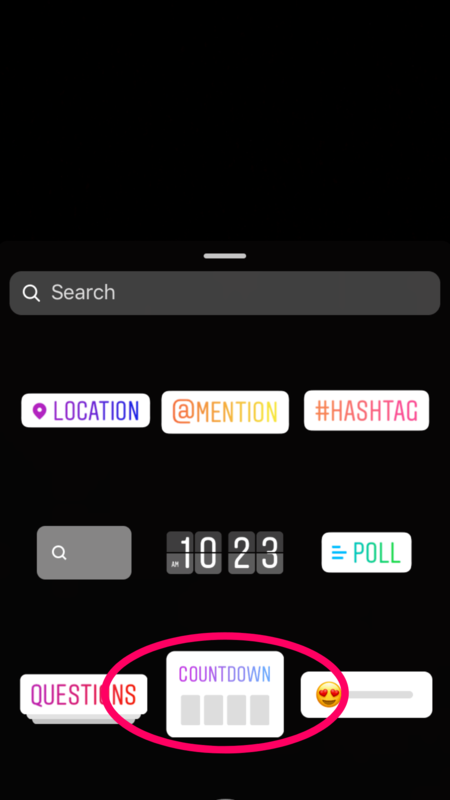 By now you may be familiar with Instagram live, but did you know there’s a newer addition to the feature that basically combines the Instagram Stories question sticker AND Instagram live?! 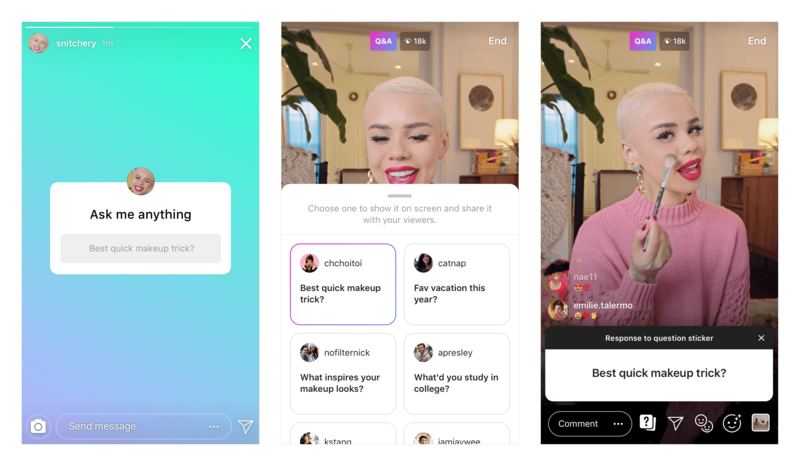 Yep, answering questions during your Instagram Live just became so much easier! Normally it can be confusing or overwhelming when trying to sift through question in the comments during a live, but now a simple question box appears and interested users can pop their question in and it displays clearly and obviously so you never miss a question. Your audience also can clearly see what question you’re currently answering, so regardless of when they join the live, they’ll know exactly what’s going on! How to: First, you have to post a question to your story, as you normally would. 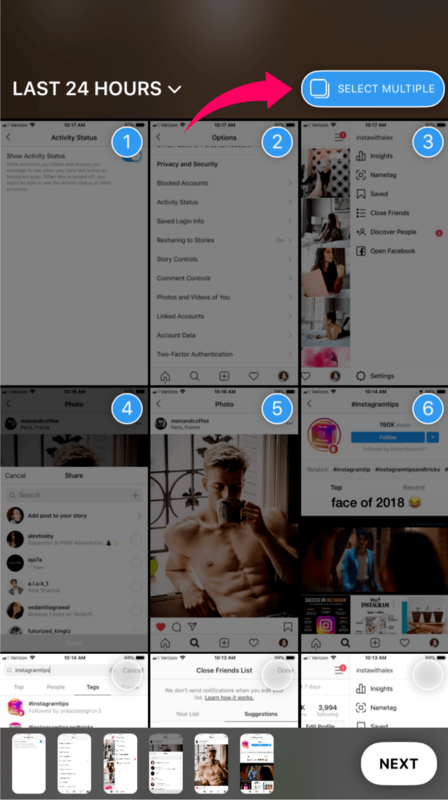 You’ll then want to wait a few minutes for some questions to come in, then start your Instagram live by navigating to your stories camera and scrolling over to the live tab. After you start your Instagram live you’ll see a question mark icon on the bottom left. Tapping this will reveal all of the questions you have been asked. Simply tap the one you want to answer and start talking! The only odd thing about this feature is that users have to ask their questions via your story and can’t actually submit any during the live (unless they type as normal in the comments). This is why it makes sense to wait for questions to come in, before starting the live. Do you use any of these features? What do you wish Instagram would implement next? A better way to recover your account if it is hacked and disabled by IG. This happened to me last week, and I went through 6 days of filling out the same reporting form and getting no response. It appeared I would lose my account @thehotelartist until the last day. There has got to be a better way to safeguard our accounts, in addition to two-factor, and to quickly recover our account if hacked. Now I do have that. I love Instagram EXCEPT for the terrible way they deal with people who lose their accounts by no fault of their own. What do you think of two factor authentication? Does that really make your account safer? FYI, I have a business account and am able to use the Activity timer feature. Great tutorial! Ah! Awesome, thanks for letting me know. I couldn’t see it on any of my biz accounts! Hi Dale, I don’t think that’s an option unfortunately. This is just to keep the data you’ve added to the app for your own personal reasons. Thanks for this ! 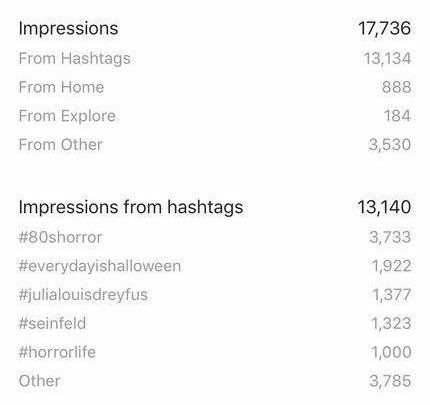 I don’t seem to have the impressions per hashtags despite more than 2000 impressions based on Hashtags. Any idea why?! Not everyone has that feature yet! Oki thanks for your answer! Looking forward to see those details :-). Thanks for this great article! Alex, all great tips. Circling the globe for another 4-6 months so I am active on IG again. So many updates I was not aware of. Awesome, thanks Ryan! Hope you had a nice trip! It’s killing me that I still don’t have the music feature on stories (biz account around 3,500) – have you happen to hear what the deal is with that? I’ve updated, uninstalled, reinstalled – the whole nine. No dice. Honestly, it makes me feel a little better knowing they’re slighting you, too… haha. Glad to know I’m not alone! Thanks for the reply. So many of these updates look great. Unfortunately, I see almost NONE of them on my account. Hopefully I will catch up on the roll-out soon, because I can see some of these being really helpful. I would love being able to see what hashtags are working. One of my posts got more than 2/3 of its likes from hashtags and I have no idea which ones worked. Also, I’d love to be able to back up all my pics right on IG. Not possible yet. Have you tried updating the app? I find that helps sometimes. I’m eagerly awaiting the hashtag insights too! In the meantime, a good way to tell which hashtags are working is to check the “top posts” for each hashtag to see if you are ranking. Tons of great tips here. While I am familiar with most, I found a few newbies, so yeah! Yay! Glad to hear that. Thanks! I actually had no idea of the individual hashtag insights, that’s definitely something I will refer to now! Thanks so much for sharing, these are all great tips!